It's your special day. You want everything to be perfect. You're planning things down to every last special detail and you have so much to do. Let Designs by Debi help alleviate some of your stress. There's no need to spend hours on end running from store to store looking for jewelry for yourself and the rest of your wedding party, struggling to find matching pieces in the colors you want. Buying handmade jewelry is the best way to get perfect jewelry. And you can find all the jewelry you need right here. There are plenty of pieces to choose from. And if you don't see exactly what you want, I can design beautiful, custom made jewelry for you, your bridesmaids and mothers......in your colors and on your budget. There are no extra fees for having jewelry custom made and consultations are free. With the hundreds of Swarovski® crystal and pearl colors available, finding the perfect match to the color or colors you've chosen for your big day will not be a problem. Fast, fun and convenient all in one place you can have earrings, necklaces, bracelets, even anklets custom designed for you and all your special ladies perfectly matched to compliment not only your dresses but your own personal styles, too. And these custom-made jewelry sets do double duty as attendant's gifts because it's easy to make jewelry they will enjoy and wear again. Have it made in different styles according to each lady's taste and personality...instead of cookie-cutter bridesmads, they can be comfortably different, have jewelry they'll love to wear again and you still get a beautiful, perfectly color-coordinated wedding party! It's quite simple to work with me and the ability to complete the entire process via e-mail means that I can accept a custom order from you no matter where in the world you may live or be having your special event. e-mailing you pictures for your approval to be sure you are absolutely delighted with the results. 10% discount on your entire order! 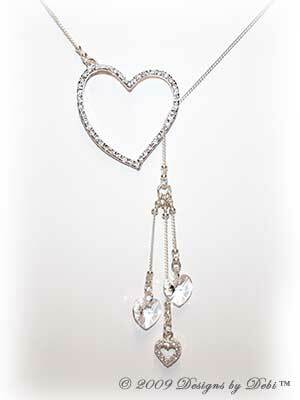 Designs by Debi has many styles of jewelry that may interest you for your special day. The Wedding Boutique is a good place to start. You can go right to the individual Wedding Necklaces, Bracelets and Earrings boutiques. You can still click on this link to my ArtFire Studio to bring up a new window taking you right to a wedding search results page of my studio. Take a look at my Signature Collection. It's a popular choice for weddings, especially for bridesmaids and mothers. Designs by Debi Tennis Bracelets are perfect for weddings and special occasions. Don't forget to look in the Gallery of Designs for some great ideas if you think you want to have pieces custom made.